ACOUSTIC EXPO 2013: In addition to all the discounts and free gifts you're getting at the Acoustic Expo, we also wanted to give you a chance to subscribe to Total Guitar, Guitarist, and Guitar Techniques at an amazing price; we are offering all attendees of this year's Acoustic Expo exclusive deals on subscriptions and single issues. 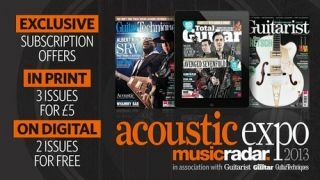 Throughout the Acoustic Expo you can subscribe to the print edition of Total Guitar, Guitarist, and Guitar Techniques and get 3 issues for only £5. After those three issues you can continue to subscribe and pay the tiny price of £24.99 every 6 months, saving 30% off the cover price. This offer will only run for the duration of the Acoustic Expo, so you need to be quick! If you'd prefer to subscribe to the digital version of Guitarist, Total Guitar, or Guitar Techniques, then we have something special for you. Subscribe to the digital version now to get 2 issues completely free! You only start paying after your no-obligation free trial. Enjoy reading your choice on your PC, Mac, iPhone, iPad or Android device; you'll get all the great content as the print edition and you'll also have access to a much larger catalogue of back issues. Free trials available on Apple, Google, Amazon Kindle and B&N Nook*. Sign up now and get up to 2 free issues - the current issue and the next! *Unfortunately the free trial is not available on Zinio. And another thing! To celebrate the Acoustic Expo this year, we have also reduced the 4 latest back issues for each of these titles. We've reduced these back issues by 50%, so if you have an iPhone, an iPad, an iPod Touch, an Android device, or even a PC or Mac, you can now read all of our guitar magazines wherever you are. Grab something that will make you a better Acoustic guitar player, teach yourself about the world of Acoustic guitars, and get some great gear ideas. Whatever the reason, make sure you take full advantage of these massive savings. This offer ends when the Acoustic Expo ends, so time is limited! Search for Guitarist, Total Guitar, or Guitar Techniques on your device now!